FRANK BRENNAN. 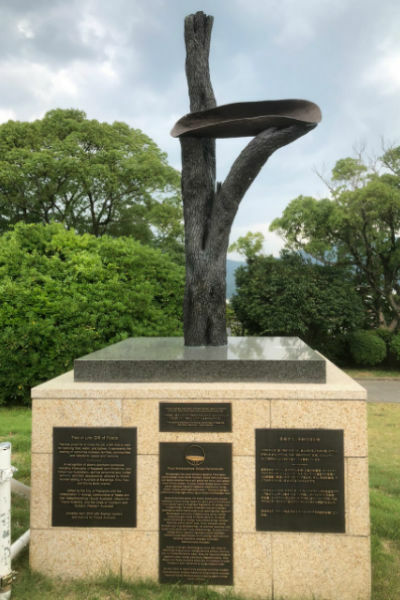 A planet to heal (Hiroshima Remembrance Ecumenical Service, Adamstown Uniting Church, Newcastle, 5 August 2018). This declaration had me mindful of the recent review by my own sister Bernadette Brennan of Draw Your Weapons by Sarah Sentilles. Sentilles cites Judith Butler: ‘We are undone by each other. And if we’re not, we’re missing something.’ Bernadette says, ‘This book calls us to be present to, and responsible for, our fellow human beings.’ The book’s epigraph from Bertolt Brecht reads: ‘In the dark times / Will there also be singing? / Yes, there will also be singing / About the dark times.’ Sentilles knows that, ‘Words can take away humanity, and words can give it back.’ Bernadette says that Sentilles’ contribution to unmaking the darkness is to write. Ours is to be attentive to the signs of the times, lighting a candle wherever and whenever we can. We gather on the eve of the 73rd anniversary of the bombing of Hiroshima. Two atomic bombs were dropped back in August 1945, the first on Hiroshima on 6 August and the next on Nagasaki on 9 August. I have entitled my remarks this evening, A Planet to Heal. This is the name of the book of essays published by Pedro Arrupe in 1975 30 years after the life changing event of his life. Arrupe was a bright Spanish medical student. He was a Basque. Towards the end of his medical studies, he decided to follow the footsteps of his fellow Basque Ignatius Loyola. He joined the Jesuit order. He was assigned to assist with the formation of young Jesuits in Japan. He was living in the Jesuit House on the edge of Hiroshima on that fateful day, 6 August 1945. In the Christian calendar, it was the feast of the Transfiguration commemorating the occasion when Jesus was on the mountain in the company of his closest companions who were blinded by the light of revelation. Arrupe then spent years travelling the globe speaking about ‘A Planet to Heal’. He became the superior general of the Jesuits and was in that position when I joined the order in 1975. He described the atomic explosion as ‘a symbol of our era. It expresses the hope and fear of modern man. Yes, the hope. Hope in the possibilities offered by the discovery of such energy, a standing proof that man is capable of using any and all means within his reach to achieve his ends. 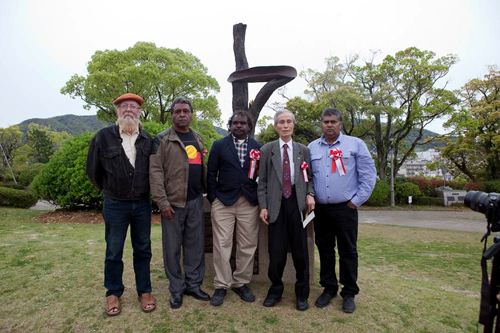 How are we to honour the commitment to peace of these Japanese and Maralinga survivors of nuclear conflagrations unleashed maliciously or negligently last century? We need to renew our commitment to painstaking negotiation of international treaties and agreements designed to ensure peace and security for all, insisting on the dignity and human rights of all. We need to commit ourselves afresh to breaking down the divisions in society and the widening gap between ‘the haves’ and ‘the have nots’, whether the divide be income, education, access to the digital revolution, health care, employment, or cultural and religious nourishment. We need to commit ourselves afresh to right relations and reconciliation in our own relationships, families, communities, and neighbourhoods. The world is on the cusp with the uncertain nuclear potential of both Iran and North Korea. Tearing up the Obama administration’s agreement with Iran, Trump decried the 2015 Iran nuclear accord as the ‘worst deal ever’; ‘horrible’ and ‘one-sided’; a ‘major embarrassment’; ‘defective at its core’. We need to insist on transparency, verifiability, and accountability with all nation states which arrogate to themselves the capacity to develop armaments able to wipe out humanity. What’s sauce for the goose has to be sauce for the gander, whether it be Iran or Israel, North Korea or the USA. We need to further our efforts in seeking international agreement, breaking down the walls of inequality and the borders which deny the human dignity of so many. This year we have the opportunity for the community of nations to sign on to international compacts on migration and on refugees. And here we have our government wanting to white ant such a splendid international initiative, articulating ideals which though not legally enforceable provide the language for engagement about the preconditions for peace: the dignity and rights of all persons no matter what side of a national border they may be, and no matter what their nationality. We are indeed entwined peoples, nationally and internationally. We have become kin. We cannot be selfish or indifferent. Peace is our passion. Peace is our mission. We have a planet to heal. For this we pray this evening. Peace be with you. Amen.